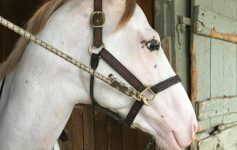 Home > Horse Sense • Mare's Musings • Mark Your Calendar!!! > Start Spreading the News: Belmont Stakes, the BEST of the Triple Crown Races–and Days. Horse SenseMare's MusingsMark Your Calendar!!! Start Spreading the News: Belmont Stakes, the BEST of the Triple Crown Races–and Days. Kentucky has Bourbon and Big Hats. Baltimore has the insanely-valuable Preakness Trophy. In seven days, the Preakness will be run. By the end of that day we’ll know if 2014 will be another year in which a Kentucky Derby winner blows out the Preak, or if those speed horses who trek to Baltimore will crush California Chrome’s Triple Crown dreams. If Chrome takes the Preak, the whole of American racing will approach Belmont Stakes Day like a pack of rabid rabbits. The very air over Elmont, New York will throb with enough electricity to light up Manhattan for an hour. As we’ve seen time-and-again: winning the Kentucky Derby and the Preakness are no guarantee that there’ll be a Triple Crown winner. Not just ANY horse can tackle Big Sandy. That mile-and-a-half on that track is the most challenging assignment in North American horse racing. So what if Chrome doesn’t head toward Triple Crown glory? What if next Saturday seemingly wrecks another Triple Crown season? Will all be lost? * Yesterday I received a press release from NYRA. (The New York Racing Association, for those readers who may not be familiar with American horse racing.). Like everyone on NYRA’s media list, sometimes I receive a few releases a day. But this particular press release was something special. I’ll opine for a minute: IMHO, too often, we in New York (State) are given a bum rap. We’re perceived as being big, brash, loud and aggressive. Well, OK, we are. But that’s a good thing. If being loud and proud of your product–your people–your contributions to culture and society is wrong–I don’t wanna be right. Don’t worry, I’m not going into a long history of all the great people, events and happenings since the Aboriginal Americans first sold the Island of Manhattan to a bunch of White folks. I’m here simply to tell you that, even if the Triple Crown isn’t on the line again this year–Belmont Stakes Day still will be a phenomenal day of racing, and Belmont Park will be The Place to be on June 7, 2014. I predict that, between the extraordinary racing–the world’s most beautiful Thoroughbreds–the fabulously rich purses–and the world-class entertainment that will mark June 7th–the entire Northeast will throb. And Elmont, New York will be the epicenter. Come again? I won’t go into the details–you can read those below–but yeah. If you’re a race fan–a bettor–or just someone who wants to see some of the most spectacular equine athletes on Earth–you need to get Thee to Belmont Park, and claim your chunk of the winnings. With all the horse starpower and All That Money in purses–the pari-mutuel tellers will be working overtime. Get Thee to Belmont, and jump into the betting pool like a duck into water. That’s cool. Money is cool. (How very materialistic of me, to write that.) But if you’re a race fan and the thought of all that money on the line–and the implications for outrageous paydays for those who hold winning tickets–this is a show you cannot miss. There’s COOL. Everyone knows the song, “New York, New York.” Big. Brash. Loud. Braggadocio to the Nth degree. If ever a song was representative of the spirit of New York City–that’s it. Even people who pretend that they hate the song take off their shoes to do a Rockettes’-style leg kick dance-thingie when it’s played at a wedding. Of course Frank Sinatra is THE singer who’s associated with the song. Unfortunately, Old Blue Eyes is chowing down on heavenly pasta now, so we won’t get to hear him sing it in person. BUT his son, Frank Sinatra, Jr., will do the honors. Check this out: As the horses walk to the starting gate for the Belmont Stakes, Frank, Jr., will lead 100,000+ lunatic race fans in song. Well, in reality, he’ll sing. Being obnoxious and jazzed out of our minds–we’ll sing along at the top of our lungs. That experience, alone, will be surreal. Adding to the surreal quotient: the horses will be serenaded as they head for the gate–right on the heels of a mini-concert by OhMyGod, LL COOL J. Listen, gang, the world’s Cool Quotient went down the day that Frank Sinatra died. 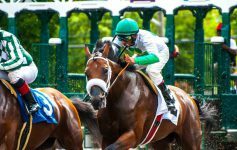 But for one golden moment in time on Saturday, June 7, 2014, Frank’s spirit and DNA will be present–bringing back The Cool–onstage at Beautiful Belmont Park. Why would you be anywhere else? I know, I’m shooting myself in the foot for encouraging y’all to be there. Even if the Triple Crown’s not on the line–even if the purses this year weren’t huge–even IF Frank Sinatra, Jr., and LL Cool J weren’t there–the place would be a mess of humanity and near-humanity. With all these fabulous things happening on one single day in Elmont, traffic will be backed up to Philadelphia. Forget that: the lines to the women’s rooms will make me think twice about drinking coffee after 5AM. But I had to tell you–my own potential discomfort aside. I couldn’t sit on all this Great News and not share it with you, my reading peeps. So there you go: be there, or be rhomboid. Sure, you could sit at home and watch with easy access to bathroom, refrigerator and remote. But then what stories will you have to tell? What memories will you make? Who will sing “New York, New York” with you, as if it matters? You may never meet a famous Thoroughbred in person at the track–but I can guarantee that you won’t if you sit on your backside in front of the TV at home. Weigh it out: watching the Belmont Stakes in your underwear, or maybe meeting a future Hall of Fame Thoroughbred and making memories to tell your grandchildren. This, I believe, is a no-brainer. Whatever you do, remember: without the horses, there’d BE no Belmont Stakes. OZONE PARK, N.Y. – The New York Racing Association, Inc. (NYRA) announced today that its 2014 Belmont Stakes card on Saturday, June 7 will offer total purses of $8 million and feature 10 stakes races. In 2013, only one card, Breeders’ Cup Saturday at Santa Anita Park, had purses totaling more than $8 million. The 13-race Belmont Stakes Day card serves as the centerpiece of a new three-day “Belmont Stakes Festival” that will offer a wide array of special hospitality and entertainment options. The 10 Saturday stakes will be worth an aggregate $7.7 million. In 2013, Belmont Stakes Day included six stakes events worth $2.95 million. 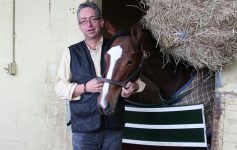 Five traditional Belmont Stakes Day contests – the Grade 1, $1.5 million Belmont Stakes; the Grade 1, $1 million Manhattan; the Grade 1, $750,000 Longines Just a Game; the Grade 2, $500,000 Woody Stephens; and the $150,000 Easy Goer will be back as part of the 2014 event. Five stakes that were not contested on Belmont Stakes Day in 2013 will also be part of the 2014 card. Topping the list is the Grade 1, $1.25 million Metropolitan Handicap. Known as “The Met Mile,” the race for 3-year-olds and older at one mile on the main track is annually considered one of the most prestigious races run in North America. Also new to the Belmont Stakes Day lineup are the Grade 1, $1 million Ogden Phipps; the Grade 1, $750,000 Acorn; the Grade 2, $500,000 Brooklyn Invitational; and the Grade 3, $300,000 Jaipur Invitational. This year’s renewal of the Brooklyn will include the “Brooklyn Bonus” whereby any horse who has previously won a graded stakes at 1 3/16 miles or longer will receive a bonus of $175,000 if he or she captures the Brooklyn. The Metropolitan Handicap and the Ogden Phipps will also serve in 2014 as Breeders’ Cup Challenge “Win and You’re In” races offering the winners fees-paid starting berths to the Breeders’ Cup Dirt Mile and Breeders’ Cup Distaff, respectively. Also scheduled as part of the 13-race Belmont Stakes Day card are three overnight allowance events – two on dirt, one on turf – offering a total of $300,000 in purses. Highlighting Friday’s card on June 6 are the Grade 2 True North and a new race, the $200,000 Belmont Gold Cup Invitational to be run at 2 miles on the turf. On Sunday, Belmont will host another new contest, the $100,000 Intercontinental to be run at 7 furlongs on turf. The Brooklyn, the Jaipur and the Belmont Gold Cup will all be invitational races with no nomination, entry or starting fees. The True North, Manhattan, Ogden Phipps, and Brooklyn will have allowance weights in 2014 after having handicap weights in 2013. Longines entered into a long-term partnership with The New York Racing Association as the Official Timekeeper and Official Watch of Belmont Park and The Belmont Stakes, and 2014 marks the third year Longines has been the entitlement sponsor of the Grade 1 Just A Game on Belmont Stakes Day. ELMONT, N.Y. – The New York Racing Association, Inc. (NYRA) has announced that LL COOL J, Frank Sinatra Jr., musicians from the United States Military Academy (USMA) at West Point, former New York Yankees great Bernie Williams and a performance from the Tony award-winning Broadway musical WICKED will headline a New York-themed group of entertainers scheduled to perform on Belmont Stakes Day, June 7, at Belmont Park. LL COOL J, a New York native, will perform two songs in between the Grade 1 Manhattan and the 146th running of the Grade 1 Belmont Stakes, the oldest and longest leg of racing’s Triple Crown. LL COOL J is an entertainment icon who has found great success crossing into multiple mediums. A two-time Grammy® Award winner, recording artist, talented actor, author, NAACP Image Award winner, entrepreneur and philanthropist, LL continues to display his wide range of talents with every project. He currently stars in the CBS hit primetime drama series, “NCIS: LOS ANGELES,” and continuing his musical expedition three decades after he first released music, LL recently released AUTHENTIC, his 13th Top-10 Album on the Billboard R&B/Hip-Hop Chart. As the horses go to the post for the Belmont , Frank Sinatra, Jr. will deliver a live rendition of ” New York , New York “, the song popularized by his legendary father and sung nearly every year at Belmont Park since 1997. Frank Jr. pays homage to his father in both song and style as he tours the world with his show, “Sinatra Sings Sinatra.” Although he originally planned a career as a pianist and conductor while studying music at the University of Southern California , Frank Jr. made his singing debut in 1963 and has gone on to fashion a musical career that continues to define the Sinatra legend. The acclaimed West Point musicians will perform the National Anthem to start the day’s entertainment, and will continue to regale guests with patriotic numbers throughout the day. Also during the afternoon, guests will be treated to a trackside performance from WICKED, which premiered at the Gershwin Theatre in Manhattan in 2003. Meanwhile, one of the most beloved New York athletes of the last 25 years, former Yankees center fielder Bernie Williams, will entertain guests in the first-floor Champagne Room with acoustic and electric guitar music – a lifelong passion that led him to be nominated for a Latin Grammy Award for Best Instrumental Album in 2009. The Champagne Room, located on the first floor of the clubhouse, is the premier destination for guests on Belmont Stakes Day, featuring a gourmet buffet, open bar with top shelf brands and a private trackside patio. Remaining seating and hospitality can be purchased by visiting ticketmaster.com or by calling 1-800-NYRA-TIX. Walk-up admission is always available either through advance purchase at the box office or at admission gates on Belmont Stakes Day itself. Previous Article Churchill Downs: Making Boatloads of Cash. And Enemies. Next Article Ria Antonia: Don’t Hate Her Because She’s Beautiful.